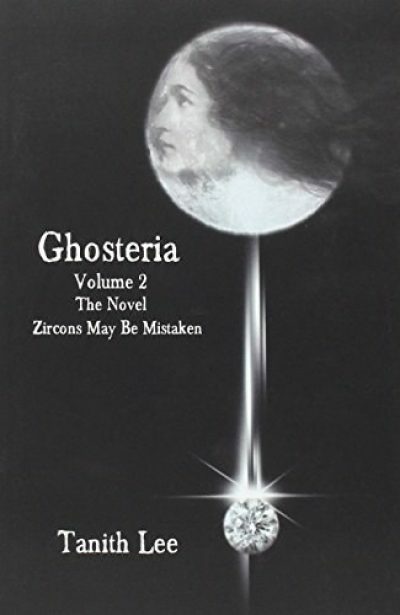 2014’s short novel Ghosteria II: Zircons May Be Mistaken is the second and final volume in Tanith Lee’s Ghosteria duology. The decaying stately home has stood for centuries. No living person has entered it in years, not since the Terror of 2020 dragged civilization down into the dark. Living people may never walk the corridors again. Indeed, it is not at all clear humans survived the Terror. The absence of living people does not mean the mansion is unoccupied. There are still the ghosts. The five ghosts died at different ages, different times and of different causes: Elizabeth was a suicide at age 40, in 1974, Coral was murdered at age 14, in the 1870s, Laurel died of the influenza at age 18, in 1918, the warrior died of violence while a young man in the 1300s and the Scholar was struck down by a very large, heavy book to the face at age 97, in 2011. Providentially, the five like each other, even if (like the warrior), they have trouble understanding each other. When the dead rose and ate the living, the ghosts were spared: no soulless zombie can touch a creature of pure soul. Now the ghosts face century after century in the crumbling house. While civilization survived, they at least had modern entertainments like the television (electronics are within the ability of feeble spectral telekinesis to operate). Now they only have each other and the occasional zombie shambling by. The scholar is the first one to realize the inability of zombies to affect ghosts does not mean the ghosts are similarly unable to affect zombies. The zombies are empty garments, waiting for someone to put them on. A creature of pure spirit could step into the walking dead and don them like used clothes. Can this bold scheme work? And if it does, what effect will the commandeered walking corpses have on their new occupants? Oh, necromancy. Is there no problem you cannot solve? One of the little surprises that come with possession is that ghost memories are unreliable, reshaping the past into forms the dead can more comfortably exist with (which, given how self-hating some of the ghosts are, is saying something). A physical brain allows the dead to recover memories and perspectives they’ve lost. These are not always welcome. How the ghosts deal with these restored memories drives the latter part of the plot. This may be the most life-affirming zombie apocalypse novel1 I have read. It helps that the ghosts are already dead: their little experiment is hardly going to kill them more than poison, pillows and heavy tomes already have. As well, the ghosts are essentially sympathetic. None of the revelations reveal the ghosts to be monstrous, just fallible. Their reactions reveal that all of the ghosts have inner strengths they themselves did not suspect. Ghosteria II: Zircons May Be Mistaken is available here. One final Lee to go. 1: Well, more novella; it may be sold on its own but it is very short.